There was a terrific turnout for a short ceremony to open the new footbridge immediately preceding the Duck Race at Whitehay. Present were Cormac’s Senior Countryside Officer, Chris Monk, who was responsible for the reinstatement of the missing bridge which was washed away in the floods of 2012, and also the Senior Chargehand, Jason Keverne, who built its magnificent replacement. Cormac’ s Communications Facilitator, Cerys Hartt, made an enthusiastic short film about the event for Cormac’s publicity and the event was also attended by The Cornish Guardian. 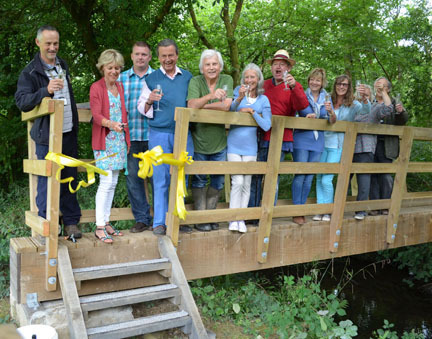 Local resident Odile Faull – whose late husband Jeremy had been a long standing Parish Councillor – snipped a yellow ribbon stretched across the bridge to officially mark its opening and a toast was drunk to celebrate the occasion. The Parish was effectively cut in half by the loss of the bridge in 2012 and more than fifty local residents applauded as the ribbon fell away from the fabulous new bridge and everyone agrees that it will be of great benefit to the community in the future.